Sandbridge Vacation Rentals vs. Hotels: What’s the Better Option? Renting a house or condo can be significantly less expensive than renting a hotel room (or rooms). At hotels, you’re paying for service: room service, maid service, parking, and concierge. However, on a beach vacation, most people will happily pass on the 8 a.m. housekeeping knock on the door and overpriced food. When you rent a house, you get to skip paying for extras you don’t want or need. When renting a house at Sandbridge Beach, you get more bang for your buck. More space, the amenities you really want such as full kitchens, washer and dryer, dishwasher, microwave, blender, and more. 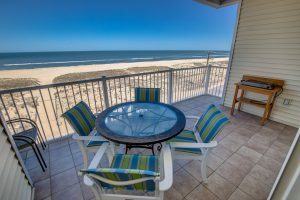 You also often find Sandbridge Beach vacation rentals give you premium locations near the attractions you love most. The average hotel room is only 325 square feet. That’s a pretty small space to share with another person, or your entire family, for a week. 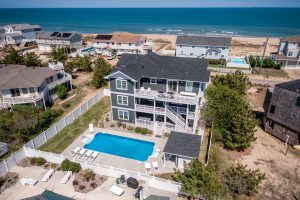 Even the coziest rentals at Sandbridge Beach have a bedroom, kitchen, dining room, living room, and a porch. Why spend your beach vacation looking at a parking lot or bank of air conditioners when you could be looking at the ocean? Many rentals are beachfront or beach view, giving you gorgeous vistas from every room. A private porch with rocking chairs is better than a tiny hotel balcony. After a day at the beach, you can spend a quiet summer evening cooking, reading, and relaxing on your porch instead of watching TV in a hotel room. Like to sleep in? Rather have your breakfast and coffee before your shower? Prefer peace and quiet to the noise of elevators and rude guests yelling outside your door? With a vacation rental house, you have complete control over the decibel level and your schedule. If you’re traveling with friends or family, everyone tends to part ways after dinner. Sharing a rental house means everyone can have their space, but still hang out together over coffee or late-night games or drinks without feeling they’re bothering others. 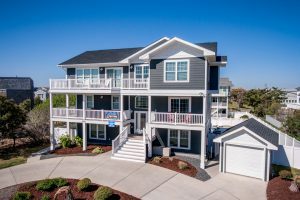 Rentals can come with fun and useful amenities such as outdoor grills, hammocks, Jacuzzi tubs, books, a fireplace, screened porch, rocking chairs, beach toys, and more. Sometimes these thoughtful touches become the best part of a vacation. Even beachfront hotels can’t rival a rental on a quiet stretch of shoreline. Hotels need space for parking, restaurants, and staff offices. Rent a house, and you won’t have to face the business end of a hotel’s location. Instead, it will be just you, your home, and the ocean. Rentals give everyone the space to do as they please. You can get the group together for a boisterous game night, or everyone can have their spot to read, nap, and relax. Few hotels allow pets, and even if they do, it can be difficult for your furry friend to find a place of their own to get comfortable. Many rentals are pet-friendly, and there’s ample room for dog beds, crates, games of chase, and whatever makes your buddy happy. A rental also allows you to give your sandy, salty dog a bath before she gets in bed with you. Rental houses let you feel what it’s like to live the dream. For a few days, you can totally sink into the rhythm of local life. Buy local ingredients at the grocery, grill fresh shrimp or fish on your porch, and sleep with the windows open and the sound of the surf and crickets lulling you to sleep. However temporary, your rental is your very own slice of heaven. Beach communities are friendly and social. 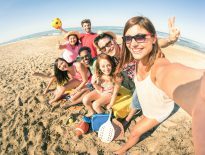 Whether you’ve brought your friends with you or you make new ones at the beach, the ability to throw a deck party or enjoy a long dinner around your table is one of the best perks of having your own place. From day-to-day operations to noisy guests and kids-gone-wild, hotels can be loud. A Sandbridge Beach vacation is all about rest. Rent a house on Sandbridge Beach, and you’ll have the ultimate vacation luxury: Peace. 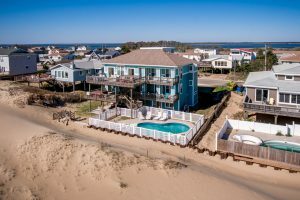 Renting a house on Sandbridge Beach is more affordable, fun, and relaxing than renting a hotel room. Sandbridge Beach rentals are all different, and each has a unique personality. Indulge in a couple of hours of picture scrolling for available rentals; choose your favorite, and then start counting down the days.